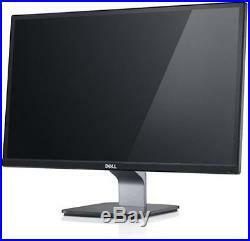 Dell 23 S2340L Widescreen Display LED Display Monitor. NEW CONDITION - IN EASY TO OPEN OEM BROWN BOX! The elegant S2340L 23 monitor offers ultrawide viewing, a virtually borderless screen and our Image Enhance feature. Customizable color: Dell Display Manager helps keep you productive with fast access to software such as Auto Mode, which enables you to select your preferred color mode for each application. Dell S2340L Monitor Monitor Stand Power Adapter GXYHH PA-1041-71 VGA Cable. Virtually borderless: Creative projects, movies and games appear expansive on this 23 screen with an almost-invisible bezel. Ultrawide viewing angle: The stellar view pulls you in from nearly any perspective with an ultrawide 178°/178° viewing angle. Stunning clarity: Savor razor-sharp detail in games, movies and photos with color-boosting Image Enhance. Vivid clarity shines with a megadynamic contrast ratio of 8 million:1 (typical) and an 82 percent color gamut Full HD resolution: Images come alive with Full HD resolution 1920x1080 max. On this glossy 23 screen in a 16:9 widescreen format. Be comfortable: Set your preferred viewing angle with extensive tilt adjustability. Tilt the S2340L panel up to 4° forward or 21° backward. Stay versatile: Easily connect to your laptop or desktop with VGA connectivity. The HDMI port enables you to explore thrilling HD entertainment options. Be environmentally responsible: In addition to being ENERGY STAR®-qualified and EPEAT® Silver-registered, the S2340L monitor features arsenic-free glass and a mercury-free LED panel. Save resources: Reduce power consumption by dimming the monitor or by putting it into sleep mode by enabling PowerNap. Display Type LED-backlit LCD monitor / TFT active matrix Aspect Ratio 16:9 Native Resolution Full HD (1080p) 1920 x 1080 at 60 Hz Contrast Ratio 1000:1 / 8000000:1 (dynamic) Color Support 16.7 million colors Dimensions (WxDxH) 20.9 in x 6.9 in x 15.7 in - with stand Horizontal Viewing Angle 178 Vertical Viewing Angle 178 Viewable Size 23 Pixel Pitch 0.265 mm Panel Type IPS Brightness 250 cd/m² Backlight Technology LED backlight. The advertisement of any product does not constitute an offer to sell. Your order does not signify our acceptance of your order, nor does it constitute confirmation of our offer to sell. We reserve the right to accept or decline your order. This agreement shall be construed under and in accordance with the laws of the state of Ohio, and all obligations of the Parties created in this Agreement are performable in Lake County, Ohio, United States of America. You may only place your order if you have read and agreed to these terms. Powered by SixBit's eCommerce Solution. The item "DELL 23 S2340L 1920X1080 FULL HD WIDESCREEN DISPLAY LED LCD MONITOR DGPV4 USA" is in sale since Friday, September 14, 2018. This item is in the category "Computers/Tablets & Networking\Monitors, Projectors & Accs\Monitors". The seller is "ascendtech" and is located in Cleveland, Ohio. This item can be shipped to United States, Canada, United Kingdom, Denmark, Romania, Slovakia, Bulgaria, Czech republic, Finland, Hungary, Latvia, Lithuania, Malta, Estonia, Australia, Greece, Portugal, Cyprus, Slovenia, Japan, Sweden, South Korea, Indonesia, Taiwan, Belgium, France, Hong Kong, Ireland, Netherlands, Poland, Spain, Italy, Germany, Austria, Israel, New Zealand, Philippines, Singapore, Switzerland, Norway, Saudi arabia, Ukraine, United arab emirates, Qatar, Kuwait, Bahrain, Croatia, Costa rica, Dominican republic.